To provide an automatic, self-cleaning filter, our designs exploit a rule of physics first described by Daniel Bernoulli in the 1700s. The Bernoulli principle says increased fluid speed creates a drop in static pressure. In the Bernoulli Filter, this pressure drop “vacuums” particles off the filter’s internal basket so they can be flushed away. The Bernoulli automatic water filter is a simple, effective invention. It consists of a housing that contains an internal basket. Inside the basket is a flat disk piston. The housing includes inlets and outlets. As a flushing filter, our design also includes a flushing valve. Dirty water enters the filter inlet. 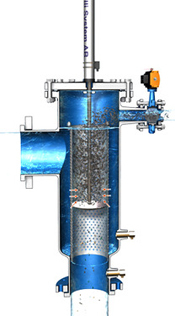 During normal operation the dirty water flows through the filter basket, where debris particles collect. Clean water flows out through the filter outlet. 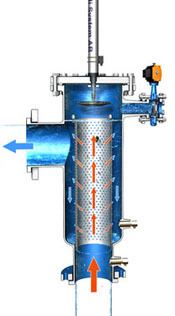 At this time, the purge valve is closed and the disk, which is mounted on a piston, remains outside the filter basket. With flushing complete, the purge valve closes and normal operation resumes. 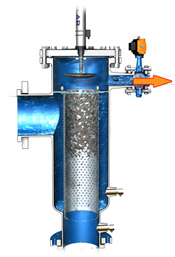 Read a more detailed description of the continuous filter process.